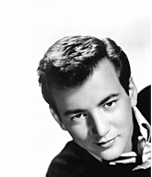 A selection of Bobby Darin vocal arrangements for solo vocalist with big band. Born Walden Robert Cassotto in New York, he was an American singer, composer and actor. He started his musical career as a songwriter for Connie Francis. His solo career finally launched in 1958 with a song called "Splish Splash" which sold over a million copies. Several other hits followed in quick succession, including "Mack the Knife" and "Beyond the Sea". In the early 1960's Darin became an all-round entertainer, made several movies and had great success on the Las Vegas nightclub circuit. He was born with a weak heart and suffered ill-health for most of his life. He died at the very young age of 37 whilst undergoing heart surgery. Which are his best known big band charts? Well, we only have a few charts to offer you at the moment, but will look to add more. "My Gal Sal", "Beyond the Sea", "Call Me Irresponsible", "Clementine" and "You'd Be So Nice to Come Home To".